We’re down to ONE active condor nest. #659—disappeared. This was the Vermilion Cliffs chick of experienced breeders 126F/26 and114/tagless. Golden eagles nesting nearby may have played a role; they have attacked other condors this spring and summer. #660—doing well! This is the offspring of female 133/tag 33 and male 187/tag 87 in a west facing cave in the Redwall limestone below Grand Canyon Village. Grand Canyon National Park condor volunteer Bob George and seasonal wildlife technician Jean Lawrence have been watching this nest from points along the Hermit Road (Trailview II, Powell or Hopi). Through a spotting scope, they’ve been seeing it appear off and on in the mouth of its cave, sometimes getting fed by its parents, at other times hopping up and down, flapping, as it prepares for taking its first flight sometime in the next few months. #674—nest failed. This was the offspring of female 210/tag 10 and 287M/-7 in the Tapeats Creek area of the western Grand Canyon. Grand Canyon National Park wildlife biologists Jean Lawrence and Cory Mosby recently spent 3 full days monitoring this nest with no sign of activity. A huge “thank you” is owed to the indefatigable Kathy Sullivan of the Arizona Game & Fish Department. Kathy has poured her heart and soul into developing the non-lead program for hunters in northern Arizona that has been a model for similar efforts in California and Utah. She is moving on after many years of hard work, but not without leaving a significant mark on the condor recovery program. Kathy, you will be missed! On the South Rim, Condor Talks are offered daily through November 30 at 2:00 pm at the Mather Point Amphitheater by Parking Lot 1. On the North Rim, the Condor Talk takes place daily through October 15 on the terrace of the Grand Canyon Lodge at 4:30 pm. 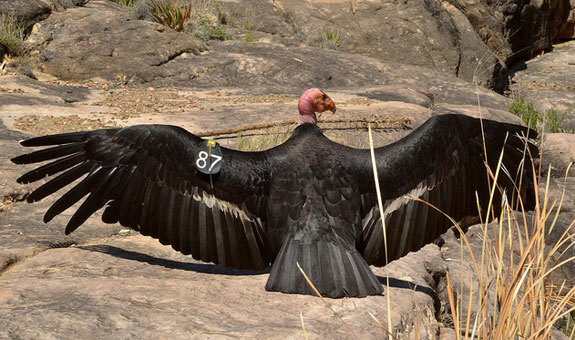 Condors are NOT often being seen at the programs these days, but the story of the condor’s rescue from the verge of extinction is a compelling one. As usual, keep an eye on The Peregrine Fund’s “Condor Cliffs” Facebook page for the most up-to-date information, and to hear how the release goes next Saturday. Find it at www.facebook.com/CondorCliffs.